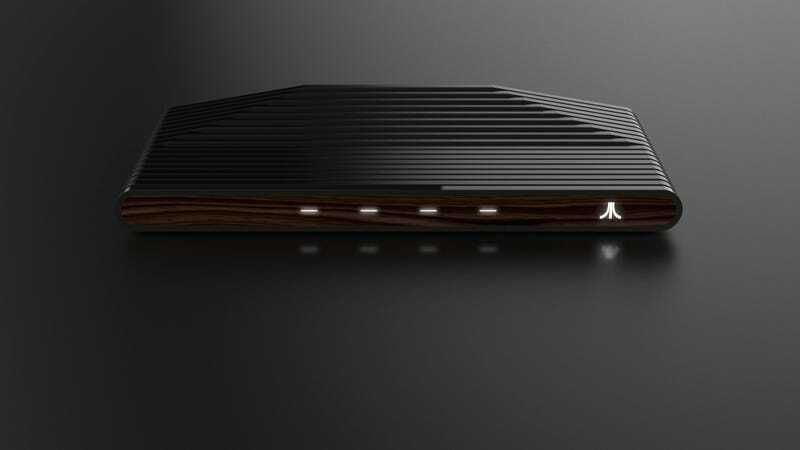 The Ataribox was initially teased back in June as a “new Atari console.” Now we have a series of renders featuring this new Atari console. It features ribbed black plastic, a callback to old Atari consoles. There are two versions, one with a wood front and one with black glass. Here is a shot of the back of the unit. Note that none of the ports is big enough to accept an Atari cartridge. So we have a box that can play “classic gaming content.” Since there is no cartridge port, that suggests emulation. Perhaps this is Atari’s take on the wildly popular NES Classic? But then the mailing also says “current gaming content.” It’s a box that does emulation of some sort, runs some current games and allows for SD card expansion. That sounds like a set top Android console to me. A Shield. A Ouya. Whatever that Mad Catz one was. We know you are hungry for more details; on specs, games, features, pricing, timing etc. We’re not teasing you intentionally; we want to get this right, so we’ve opted to share things step by step as we bring Ataribox to life, and to listen closely to Atari community feedback as we do so. Unless they have no real idea what the Ataribox will do either, they’re teasing us intentionally. We’ll have more on whatever it is once they decide to stop. Update 9/26/2017: Today Atari revealed more details on its box, and it’s actually a Linux machine running on a chip-based system, with an Indiegogo campaign launching to fund it this fall. Check out Gizmodo for more info.